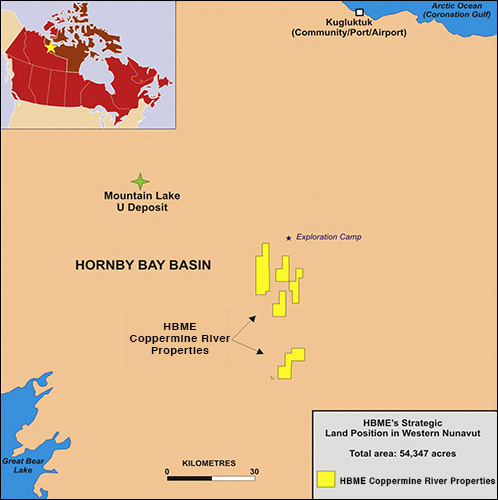 The Coppermine River Properties, with their uranium targets, are 100% owned by HBME and currently consist of 13 leases. In November 2016, Hornby’s Management decided to drop 10 leases that formed part of the Nunavut property since the cost to maintain land leases is high and these 10 leases were outside of the Company’s strategic holdings within the total land package. The reduction in Hornby’s land proposition will save the Company roughly $24,000 in land lease rents annually. There are still 13 primary untested uranium targets. The Coppermine River Property is located in the northern region of the Early Proterozoic Wopmay Orogen, where the units of the orogen are overlain by Middle Proterozoic sedimentary rocks of the deeper, eastern lobe of the Hornby Bay Basin. Most of the Coppermine River Property is underlain by rocks of the Hornby Bay Group, which in this area comprises the Big Bear Formation (lowermost unit of the basin dominated by eolian sandstones, conglomerates, and siltstone) and the Lady Nye Formation (dominated by conglomerates and fluvial sandstones). Subordinately, deltaic and shallow marine rocks of the overlying Dismal Lakes Group (sandstone, shale, and dolostone) underlie the northern part of the property. The stratigraphic column in the area covered by the Coppermine Property has three major unconformities: 1) the basal unconformity, at the interface between the basement rocks, which are characterized by patchy regolithic development, and the Big Bear Formation; 2) the boundary between the Big Bear and Lady Nye formations, which marks a major basin re-organization and change in sediment source; and 3) the generally conformable contact between the Hornby Bay Group and the Dismal Lake Group, which reflects a gap of more than 50 million years in sedimentation and marks the transition from intra-continental depositional systems to marine shelf sedimentation. Basement units are exposed along some of the margins of the Coppermine River Property. In the southwestern corner of the northern block of claims the basement rocks are felsic volcanic and volcaniclastic rocks of the Great Bear Magmatic Zone; the basement units exposed in the southern part of the northern block of claims, as well as in the southern block of claims are igneous and metamorphic rocks of the Hepburn Metamorphic-Plutonic Belt, which represents the core zone of the Wopmay Orogen. The boundary between the Great Bear Magmatic Zone and the Hepburn Metamorphic-Plutonic Belt is marked by a complex fold and fault zone (Wopmay fault) that based on geological and geophysical data appears to extend northward under the Hornby Bay Basin rocks. Prominent northeast- and northwest-trending faults, as well as north-trending faults occur in the area of the Coppermine River Property. The basement of the basin is severely affected by faulting with significant (up to hundreds of meters) vertical displacements, which are reflected in the basement topography. Most of the basement faults were initiated during the phases of compressional deformation that affected the Wopmay Orogen, and their subsequent post-orogenic extensional reactivation led to formation of block topography of the basement surface, before deposition of the Hornby Bay sediments. The pre-existing topography of the initial depositional surface (i.e., basin unconformity) had a major influence on sedimentation patterns and, as a result, on the thickness and continuity of the lower members of the basin layers; in addition, the topography of the basin unconformity was enhanced by continued movement along the basement faults during and after sedimentation, which also caused fault propagation within the rocks of the basin. 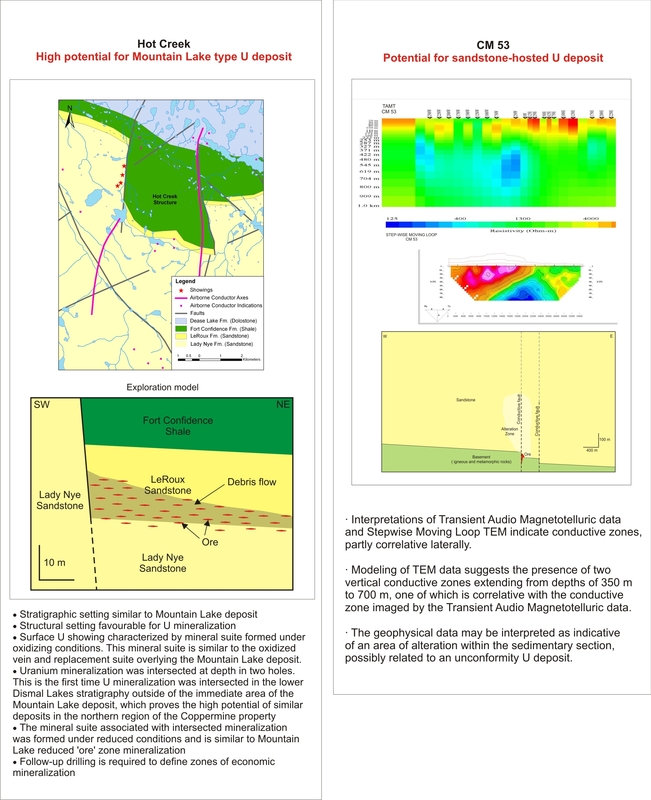 The rock units underlying the Coppermine River Property are pervasively intruded by north-, northeast-, and northwest-trending diabase dykes, which range in thickness from a few metres to 50 metres. The large number of dykes and their prominent magnetic character precludes detailed information on the basin unconformity topography from magnetic data in most of the area covered by the Coppermine River Property. Since 2004, HBME has conducted intensive programs of geological/structural mapping and radiometric prospecting on the property. This work has led to the delineation of several key areas of interest, such as the Hot Creek, Contact Lake East, Wolf Creek, CM 53, CM 56, and the Alteration Zone - Bluto Lake - Bog area. In addition, all historical uranium showings have been re-evaluated. Airborne surveys were conducted in 1998 (GEOTEM), 2003/2004 (GEOTEM, magnetic, gravity), and 2005 (MEGATEM). The gravity data has proved particularly useful in the southern extension of the property (the panhandle area), where it provided constraints on the depth and geometry of the basin. Numerous prominent basement conductors were interpreted from the MEGATEM data. Ground follow-up of the conductors delineated from the airborne surveys has been carried out since 1998. 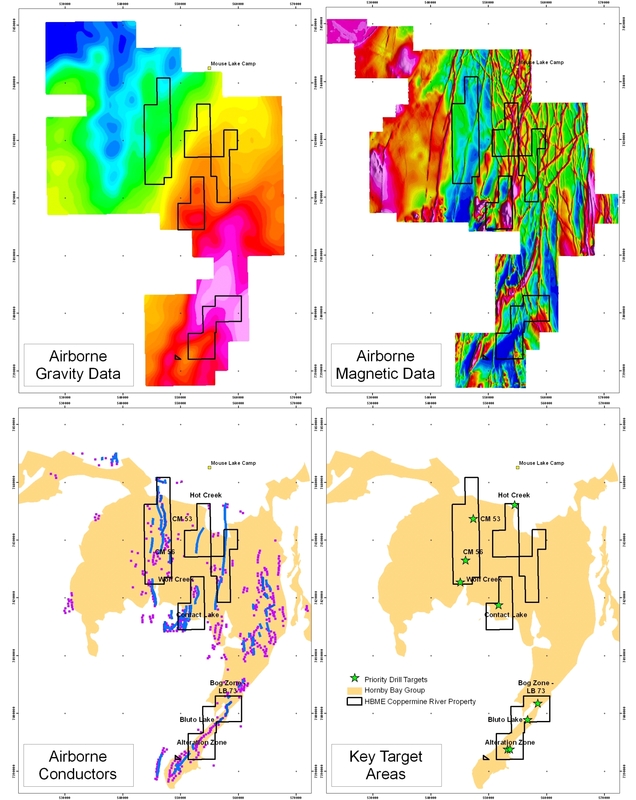 In addition to time-domain electromagnetic surveying of grids over airborne anomalies, the ground geophysical work has included: electromagnetic soundings to predict depth to the unconformity; down-hole electromagnetic/radiometric surveys of drill holes; induced polarization surveys aimed towards finding areas of increase pyrite content or areas of silicification; and transient audio magneto-telluric surveys, which were employed to identify regions of alteration at depth and to map conductive basement structures. 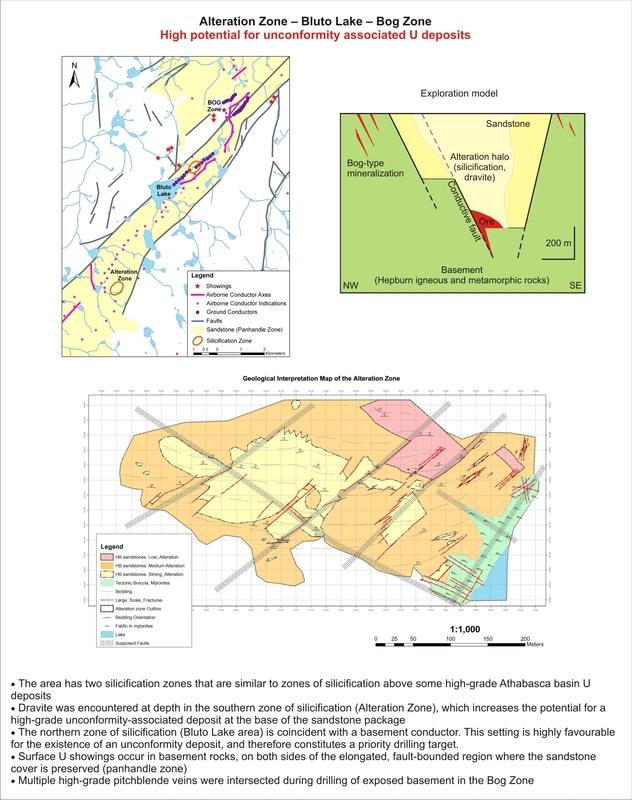 Intersection of uranium mineralization in the Bog area (best intersection being 0.12% U3O8 across 9.1 meters, and highest grade being 1.25% U3O8 across 0.5 meters). The holes drilled in 2006 plus the historical drill holes of BP Minerals suggest that mineralization occurs in an area of 800 meters by 200 meters. The structural setting is similar to that of Cameco's Eagle Point deposit in the eastern margin of the Athabasca Basin. Intersections in the Hot Creek area of 4- to 6-meter thick intervals of radioactivity. Analysis of uranium mineralization from one of these intervals indicates that it formed under reducing conditions and is similar to the reduced zone mineralization in the Mountain Lake deposit. Best assay is 0.1% U3O8 across 0.7 meters. 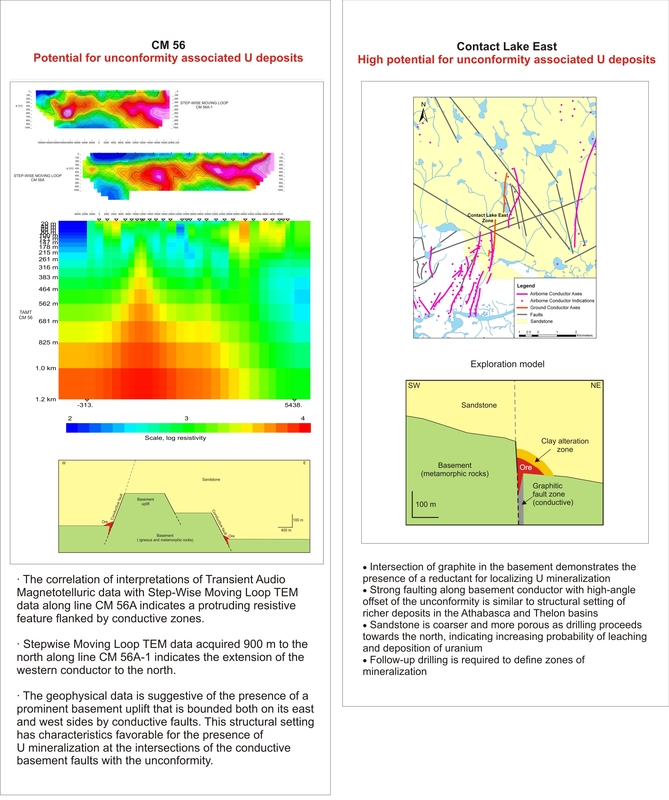 Intersection in the Contact Lake East area of multiple zones of elevated uranium pathfinder elements in the sandstone and basement. A vertical fault off-set of +100 meters in sandstone occurs in this area. Intersection in the southern panhandle area of multiple zones of clay alteration and bleaching capped by silica flooding and replacement. The uranium pathfinders, in particular boron, are extremely elevated in zones of shearing and alteration.